McCollum was born in Mableton, Georgia. In 2015, he adopted the stage name "Yachty" and moved from his hometown of Atlanta to New York City to launch his career. He stayed with a friend and networked with online street fashion personalities, while he built up his own Instagram following. Yachty first came to prominence in December 2015 when the SoundCloud version of his song "One Night" was used in a viral comedy video. In February 2016, Yachty debuted as a model in Kanye West's Yeezy Season 3 fashion line at Madison Square Garden. 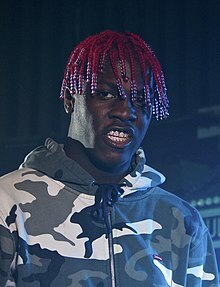 Yachty's debut mixtape Lil Boat was released in March 2016. In April 2016, Yachty collaborated with DRAM on the hit song "Broccoli", which peaked at number 5 on the Billboard Hot 100. He featured on Chance the Rapper's Coloring Book mixtape, released in May 2016. On June 10, 2016 he announced he had signed a joint venture record deal with Quality Control Music, Capitol Records, and Motown Records. Yachty released his second mixtape Summer Songs 2 in July 2016. In December 2016, he was featured on the hip hop single "iSpy" by Kyle. He was featured in Tee Grizzley's single "From the D to the A", released in March 2017. On May 26, 2017, Lil Yachty released his debut studio album, Teenage Emotions. It features guest appearances from Migos, Diplo, Evander Griiim, Grace, Stefflon Don and YG, among others. Three promotional singles were released to co-incide with the album. The first promotional single, "Harley", produced by K Swisha, was released on April 14, 2017. The second promotional single, "Bring It Back", produced by Free School, was released on May 4, 2017. The third promotional single, "X Men", produced by 30 Roc and Tillie and featuring a guest appearance from American rapper Evander Griiim, was released on May 18, 2017. He featured in a remix of "With My Team" by Creek Boyz, released December 15, 2017. Lil Yachty announced on February 20, 2018, that his album Lil Boat 2 will be released on March 9, 2018. It was confirmed earlier, on January 21, 2018, that Lil Yachty and Takeoff have collaborated on an album that is yet to be released. He was featured on the Ocean Park Standoff single "If You Were Mine", released on April 27, 2018. On November 2018, Yachty made his made his debut on Sean Evan's YouTube series Hot Ones. Lil Yachty has called his style "bubblegum trap." His songs have sampled sounds ranging from Mario Bros., Charlie Brown, the theme from Rugrats, and the startup sound of a GameCube console. Other themes in his works include clouds, cotton candy, the Super Nintendo, and scenes from Pixar films. His friend TheGoodPerry is heavily involved in the production of his songs. Yachty's style has also been described as mumble rap. Rolling Stone described his music as "catchy, intentionally dinky-sounding tunes packed with off-color boasts delivered in a proudly amateurish singsong." The Guardian called his music "fun, hook-first pop rap oblivious to songcraft and structure that doesn't take itself too seriously, with very little interest in legacy and even less in rap canon." Yachty attended Alabama State University in fall 2015 but dropped out to pursue his musical career. In a 2016 interview for CNN, Yachty expressed support for Bernie Sanders in the 2016 presidential election, and praised Sanders in his work during the civil rights movement. Yachty made a guest appearance in a Sprite commercial with LeBron James, where he is seen in an ice cave playing the piano. Lil Yachty was picked to be the face of the new Nautica and Urban Outfitters collection. Yachty also appeared in the "It Takes Two" video with Carly Rae Jepsen for Target. In 2018, Yachty worked with Donny Osmond to create a theme song for Chef Boyardee titled "Start the Par-dee". On September 1, 2015, Yachty and one other man were arrested at a mall in Palm Beach Gardens, Florida for credit card fraud, Yachty was released after posting a bail bond of $11,000. According to Yachty, his records were expunged. ^ "From Lil Peep To Paramore, Emo And Rap Have Been Related For Years — Kerrang!". Kerrang!. Retrieved October 22, 2018. ^ a b c d e f Pearce, Sheldon (November 30, 2016). "From Lil Yachty to DRAM, 2016's best hip-hop is all about black joy". The Guardian. ISSN 0261-3077. Retrieved December 6, 2016. ^ a b Charity, Jus tin (April 18, 2017). "Declaring a Moratorium on the Term "Mumble Rap"". The Ringer. Retrieved May 14, 2017. ^ "The Post-Internet Worlds of Atlanta Rappers Lil Yachty and Playboi Carti". MTV. Retrieved March 30, 2016. ^ "Lil Yachty, Lil Uzi Vert and Playboi Carti, Oddball Rap's Children, at Play". New York Times. Retrieved March 30, 2016. ^ "Lil Yachty Lil Boat". Pitchfork. Retrieved March 30, 2016. ^ "Meet Lil Yachty, The Atlanta Rapper Born To Go Viral". The Fader. Retrieved March 30, 2016. ^ a b Hernandez, Victoria (June 10, 2016). "Lil Yachty signs deal with Quality Control". Hiphopdx.com. Retrieved June 11, 2016. ^ a b c d e f Weiner, Jonah (November 9, 2016). "How Lil Yachty Went From Instagram Whiz to Kanye West Collaborator". Rolling Stone. Retrieved December 6, 2016. ^ "Rapper debuted 'The Life of Pablo' and Yeezy Season 3 fashion line at Madison Square Garden". Rolling Stone. Retrieved March 30, 2016. ^ Hernandez, Victoria (March 10, 2016). "Lil Yachty "Lil Boat" Mixtape Stream, Cover Art & Tracklist". HipHopDX. Retrieved December 6, 2016. ^ fashionablyearly (June 14, 2016). "Lil Yachty Signs With Capitol Records". Retrieved July 1, 2016. ^ Rappaport, Ben (July 20, 2016). "Lil Yachty Drops New Mixtape, 'Summer Songs 2′". Retrieved August 5, 2016. ^ Gooden, Darren (December 2, 2016). "KYLE - "iSpy" ft. Lil Yachty". Artistic Manifesto. Retrieved March 28, 2017. ^ Low, Carver. "Tee Grizzley - From The D To The A Feat. Lil Yachty | Stream [New Song]". Hot New Hip Hop. Retrieved March 28, 2017. ^ "Lil Yachty Reveals 'Teenage Emotions' Album Tracklist and Official Cover". XXL. Retrieved May 24, 2017. ^ Dandridge-Lemco, Ben (April 20, 2017). "Lil Yachty Announces Release Date For Debut Album, Teenage Emotions". The Fader. Retrieved May 24, 2017. ^ Goddard, Kevin (April 14, 2017). "Lil Yachty – Harley". HotNewHipHop. Retrieved May 24, 2017. ^ Findlay, Mitch (May 4, 2017). "Lil Yachty – Bring It Back". HotNewHipHop. Retrieved May 25, 2017. ^ Weinstein, Max (May 4, 2017). "Lil Yachty Drops His New Song "Bring It Back"". XXL. Retrieved May 25, 2017. ^ Carey, Jonathan (May 18, 2017). "Lil Yachty – X Men Feat. Evander Griiim". HotNewHipHop. Retrieved May 25, 2017. ^ Berry, Peter A. (May 18, 2017). "Lil Yachty Flexes on New Song "X Men"". XXL. Retrieved May 25, 2017. ^ Burney, Lawrence (December 14, 2017). "The Creek Boyz Recruited Lil Yachty For A New Version of "With My Team"". Noisey. Retrieved December 15, 2017. ^ Maicki, Salvatore (February 20, 2018). "Lil Yachty announces "Lil Boat 2" release date". The Fader. Retrieved February 21, 2018. ^ "Lil Yachty and Takeoff Have a Joint Project Coming Soon". XXL. Retrieved February 16, 2018. ^ Abby Jones, "Ocean Park Standoff Blends Genres With Lil Yachty-Assisted Banger 'If You Were Mine'," Billboard, April 26, 2018. ^ J., Miranda (August 31, 2016). "9 Rappers Who Went to College But Didn't Graduate". XXL. Retrieved February 16, 2018. ^ "Lil Yachty on getting into Bernie Sanders via Lil B". CNN. Retrieved August 13, 2018. ^ Samuel, Cameron (December 17, 2016). "Lil Yachty Has Never Eaten A Fruit Or Vegetable In His Entire Life". City Of Hype. Retrieved April 17, 2019. ^ "Lil Yachty and LeBron James Team for Sprite Commercial: Watch". Retrieved May 17, 2017. ^ "Lil Yachty Nautica Meet and Greet at Space Ninety 8". UO Blog. ^ "Watch Carly Rae Jepsen and Lil Yachty Cover 'It Takes Two' in Target Ad". Pitchfork. February 12, 2017. Retrieved February 13, 2017. ^ "Lil Yachty on his bizarre Chef Boyardee jingle with Donny Osmond: 'This is very odd'". USA TODAY. Retrieved October 21, 2018. ^ Sacasa, Adam (September 1, 2015). "Two men accused of having dozens of fake credit cards at mall in Palm Beach Gardens". The Sun-Sentinel. ^ "Lil Yachty Tapped to Voice Green Lantern in Upcoming 'Teen Titans GO!' Movie". Billboard. Retrieved July 26, 2018. ^ "'Life Size 2' Was Cringey, But the Live Tweets Were Hilarious". Vice Media. December 4, 2018. ^ Petski, Denise; Andreeva, Nellie (March 7, 2019). "'How High 2': Mike Epps To Reprise Baby Powder Role In MTV Sequel; Premiere Date Set". Deadline Hollywood. ^ "Here Is the Complete List of Nominees for the 2017 Grammys". Billboard. December 6, 2016. Retrieved January 17, 2016.